The Anterior Cruciate Ligament (ACL) is located in the middle of the knee joint and connects your thighbone to your shinbone. The main function of the ACL is to keep the knee joint stable. ACL injuries are most commonly seen in sports that require sudden stops and changes in direction. These include basketball, soccer, football and skiing. An ACL can also be injured from a direct blow to the knee. Symptoms of an ACL injury include pain, swelling, tenderness, and loss of function of the knee joint. Some people hear a loud popping sound upon tearing their ACL. If you have a Grade 1 or Grade 2 ACL injury, you can use our ColdCure® and BFST® products to heal and feel better. If you have a Grade 3 ACL tear, you may need surgery, but you can still use our products to help speed up your recovery following the procedure. You should consider using crutches during the recovery process to avoid re-injury. Putting weight on your injured knee could cause further strain and damage, undoing the healing you've done along the way. You don't want to lengthen your recovery time, you want to speed it up. You need to rest sufficiently during your recovery so you don't make your condition worse. Don't do any activities that could cause re-injury to your ACL. Stop doing the activity that caused your ACL injury. If you want to heal quickly, try to rest your knee as much as possible for the first 4-6 weeks of recovery. After the 4-6 week mark, you can start doing some light stretching and strengthening exercises. Slowly work your way back to your regular level of activity by continuing to do regular BFST® treatments. You can also use the ColdCure® Wrap to relieve your pain and swelling if you experience any flare-ups during the healing process. The BFST® Knee Wrap is designed to bring healthy blood flow to your injured ACL, creating an ideal environment for healing. This increase in blood flow works to accelerate the healing process by improving the circulation deep below in the area of injury. Improved blood flow is what helps your ACL heal. The Knee Wrap and Energy Web® are custom designed for the shape of the knee, to ensure there is an even distribution of energy over your injured ACL. The BFST® Wrap is not a heating pad. Heating pads have very little therapeutic value since they only heat the surface of the skin. The BFST® Wrap penetrates below your skin and fat to promote blood flow in the injured area. Heating pads can't do this. The BFST® Knee Wrap has 3 levels, allowing you to increase the power of your treatments as you heal. In order to heal completely, continue doing BFST® treatments even after you feel better. This will maintain the healing you've done and prevent re-injury. Do a BFST® treament before any physical activity to warm up your circulatory system. You don't have to wait for endless months in pain. You can heal much more quickly with the right treatment. 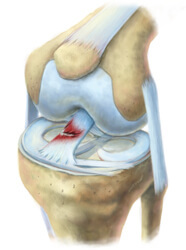 For an ACL injury, blood flow is the most critical element in rapid recovery. Blood Flow Stimulation Therapy (BFST®) gives your ACL the blood flow it needs to heal quickly and completely. BFST® brings extra oxygen and nutrient-rich blood to the injured area - a requirement for the body to heal itself. Unfortunately, an injured ACL at rest often has restricted blood flow, which in turn limits the body's ability to heal. Physical activity will promote blood flow but all too often it also results in small but frequent re-injury, which extends your healing time and greatly increases the amount of scar tissue that develops. With a King Brand® BFST® Knee Wrap, blood flow can be stimulated in your injured ACL while you are at rest. With improved blood flow and without physical activity and the risk of re-injury, you can recover from your ACL injury at a surprisingly rapid rate. The ColdCure® Knee Wrap is designed to relieve the pain and swelling associated with ACL injuries. The combination of our cold gel packs and our neoprene compression wrap results in fast and effective relief of your symptoms. Since our Knee Wrap and gels are specifically designed to conform to the exact shape of your knee, you get complete coverage of your injury during every treatment. Our unique XC RigiGel® formula helps to keep the gel in place right where you need it - it targets the exact area of your injury and stays there to provide an even and consistent cold treatment. XC RigiGel® packs have 3x more cooling power than ordinary gel packs. This means longer treatments, so you won't have to swap the gel packs out as often. XC RigiGel® packs also contain 10x more gel than ordinary packs, resulting in maximum coverage of your knee. You don't have to worry about hot spots in your gel either. XC RigiGel® eliminates hot spots by moving the cold energy in the gel to the places it's needed most. Painkillers mask the pain and cause you to continue to stress and injure your ACL. This only makes things worse. It is understandable that people need relief from the pain, so if you have to take painkillers, try to restrict them to times when you are sleeping. Using painkillers when you are active is a recipe for permanent damage. The safest and most effective pain reliever is a ColdCure® Knee Wrap. The ColdCure® Knee Wrap is specifically designed to treat ACL related pain. It also does a superior job of relieving pain and swelling. This innovative device is incredibly soothing and protects your ACL from further strain. The painkilling element is very powerful and it works instantly - there's no 20 minute wait like with pills. ACL injuries can be extremely painful and debilitating. NSAIDs such as ASA, acetaminophen or ibuprofen are often used to treat the pain but these drugs do nothing to treat the actual condition. In fact, NSAIDs are known blood thinners and make the bleeding worse for fresh tissue injuries. Cortisone injections are used in extreme cases but these too are intended to address the pain. They do not promote healing of the injury itself and they put you at a very high risk of further injury. King Brand® ColdCure® and BFST® Wraps are FDA Registered medical devices. They are designed to prevent, treat and cure soft tissue injuries and chronic conditions. Part of being an FDA Registered company means that our products are made from high quality, biocompatible materials. These devices are manufactured and tested to the highest safety standards in the industry. Note from KB WebMaster - The text below is primarily intended to assist with Google properly classifying this page content. To learn more about our products please visit our website.<br>ACL injuries plague many people. A bad ACL injury causes knee pain. There are many symptoms of knee pain caused by ACL injuries. Treatment for an ACL injury will cause your knee pain to improve and your ACL tear to heal. There's no doubt that to heal ACL injuries quickly you need BFST treatments. ColdCure will help with knee pain. You can cure knee pain and an ACL injury with BFST and ColdCure technology. So, if you want to heal your injured ligament quickly, you need BFST. If you want to treat knee pain you need ColdCure. ACL injury symptoms are knee pain and swelling. A sore knee can be helped with knee exercises although knee exercises won't cure ACL injuries. Some ACL injuries require surgery. This heals the injured ligament but the pain in your knee after surgery can be severe. The best ACL injury treatment is BFST. The best ACL pain treatment is ColdCure. These wraps are incredible. They feel comfortable. They work.